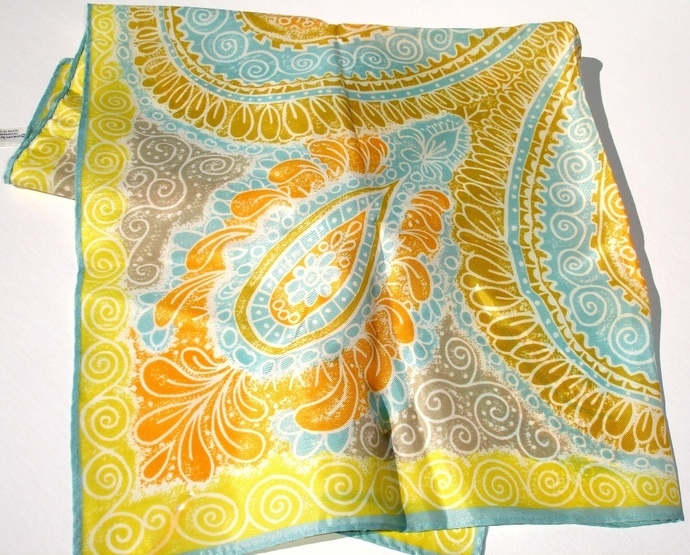 This is a lovely Vera Neumann Orange Teal Tan yellow And White Paisley design scarf. It has a large scale paisley design. As pictured it is signed Vera with the ladybug symbols and copyright symbol which dated it to the early 1960s. 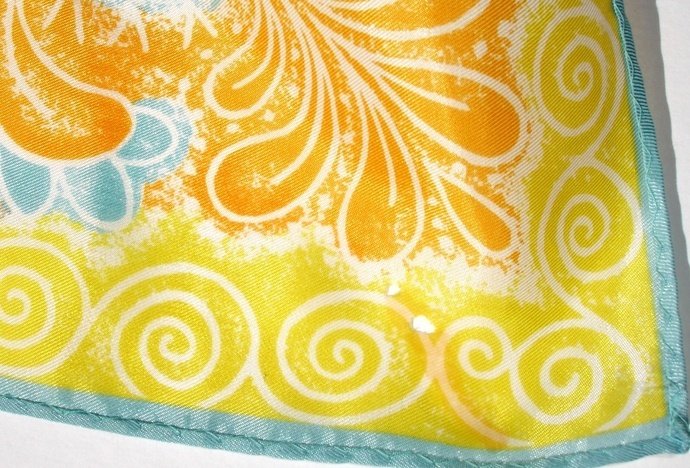 This scarf measures approximately 26" x 26". 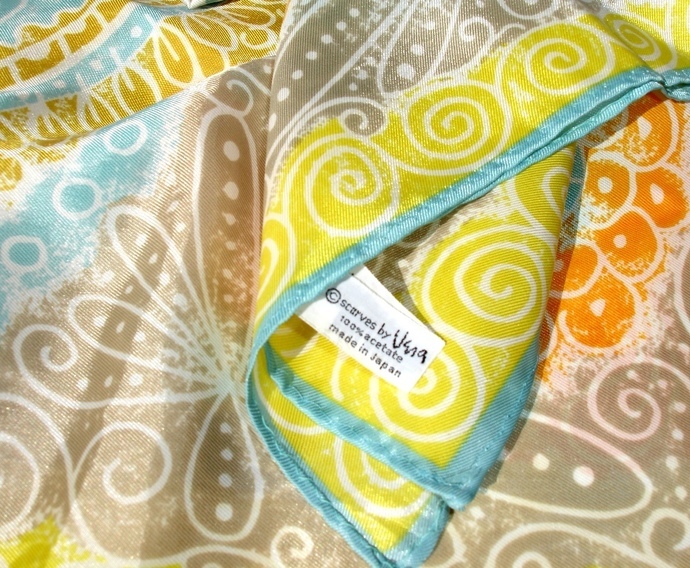 It also still contains its original tag which reads" Scarves for Vera-100% acetate-Made in Japan" This scarf has a rolled hem and is in good vintage condition. There are two small holes and small stain which is visible in the one picture, however there are no pulls, tears, rips or on this lovely scarf. There are many ways in which this lovely scarf can worn where the two small flaws will not be visible. This beautiful scarf will give you many years of colorful enjoyment and will add a chic splash of vibrant color to your outfit of choice. 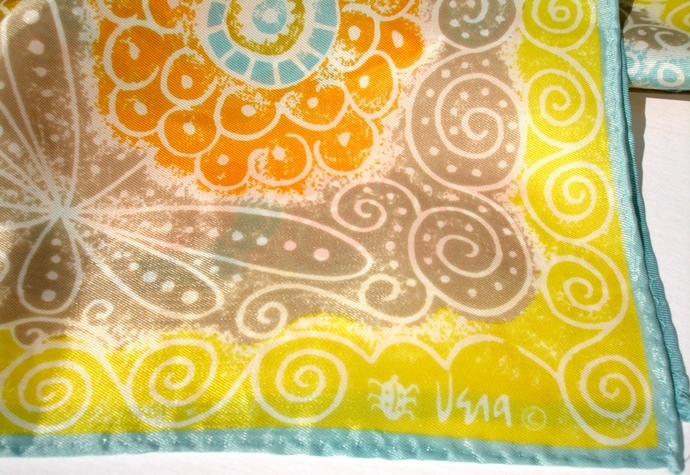 This Vera Neumann Orange Teal Tan Yellow And White Paisley Design scarf will ship USPS Priority Mail with tracking and insurance within the United States. NOTE: We always do our best to point out and photograph any flaws that are visible to the naked eye as we in no way wish to misrepresent the condition of this or any other product that we are selling. This is a vintage item and as such can be expected to show some signs of normal wear. If you would like to read how we classify or grade our scarves you can find that information on our blog, just click the blog tab above and look under the instructional guidelines category. Thank you.